Becoming toilet trained is crucial in a child’s journey to independence, but progressing from nappies to underwear can feel difficult for both parents and children. 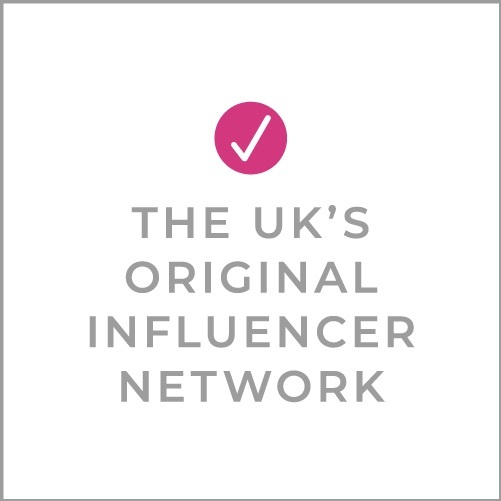 With so much help and advice around, parents end up using a variety of techniques and products (nappies, nappy-pants, cloth pants) applied inconsistently. It means potty training can quickly become a daunting exercise full of potential risks. Instead, it should be something that helps your child become a big kid. This summer, as you embark on your own potty training journey with your little one, we’ve helped to dispel some of the myths out there, with a little help from Huggies® Pull-Ups®. We’re often told there’s a ‘right time’ to start. In fact, every child is different and develops at their own pace. Some can be fully trained by 24 months, a small percentage aren’t ready til they’re 3 and a half. There are guidelines to help you recognise the signs that your child is ready for potty training. Check out these 8 signs that show your child is ready to start. 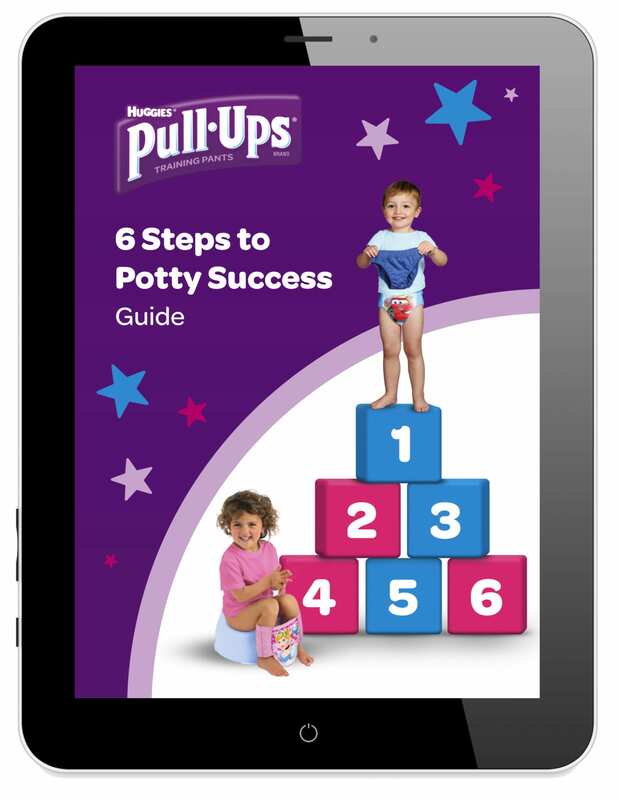 Just as a potty provides the potty training support for little ones before they are ready for the toilet, Huggies® Pull-Ups® provide the training support they need before they are ready to transition to real underwear. Pull-Ups® are a valuable tool for parents and children, building confidence and letting little ones learn to pull their pants up and down for potty and providing comfort during a period of learning. They help bridge the transition between nappies and using the toilet. For many parents who find potty training a daunting exercise, this can be extremely helpful in making the transition smoother. Huggies® Pull-Ups® are designed to be just like real underwear but with all the protection they need as well as a host of extra benefits. The shape of the pant and fun Disney graphics are designed to look just like real underwear with super soft and stretchy sides that mean little hands can practice pulling them up and down all on their own. Potty training is a journey that begins as soon as they are with you in the bathroom, the first time they put on a Huggies® Pull-Ups®, the first time they realise there are toilets they can use outside the home. There is a whole host of exciting steps and revelations that involve all kinds of learning. Get top tips for building a potty training routine here. The biggest achievement in potty success is recognising the need to go. To help little ones on this journey, when little accidents happen, the unique learning layer in Huggies® Pull-Ups® briefly mimics the feeling of real wet underwear, before quickly drawing the moisture away. That way they learn wet from dry in a protected environment and ultimately learn to stay dry on their own. 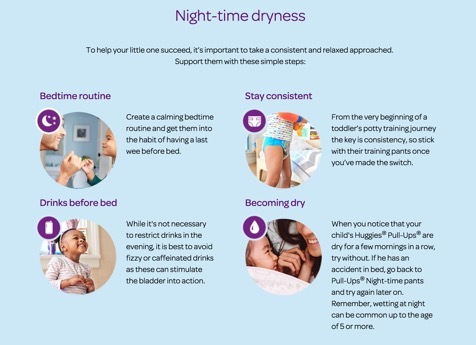 Huggies® Pull-Ups® also have a wetness indicator for parents that visually indicates wet vs dry and helps with this important learning step without allowing tender skin to stay wet and irritated. Discover more great games and tools for this step. For children to wake up in the night to go to the loos, the nerve pathways between the bladder and the brain must be strong enough to wake them from a deep sleep. In addition, it’s only with age – between 2 and 7 – that the body develops a slowdown in nighttime urine production. (That’s why fluid restriction doesn’t guarantee dry nights.) Accidents are normal, so it’s best to handle these with patience, reassurance and support. Pop on a dry pair of Huggies® Pull-Ups® with a supportive explanation. These 4 steps to moving toward night-time dryness will help. After the initial excitement, it’s easy for children to lose interest and backslide. 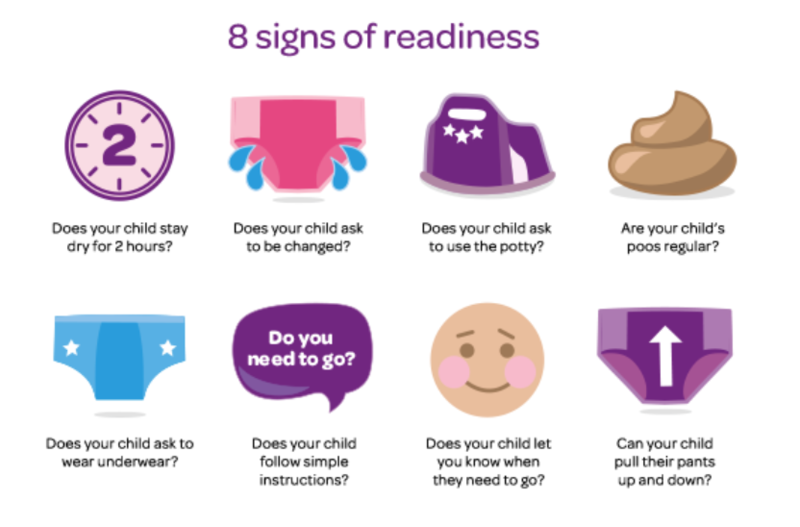 As parents we should expect it and be ready with encouragement and support to keep going on the potty training journey. To ensure their growing independence, we need to keep them motivated – with praise, goals and rewards. Find more info about this step here including Big Kid certificates. Did you know all these things already? What have been your biggest challenges and concerns with potty training? This makes so much sense. We are currently potty training my 3.5 year old as she just wasn’t ready before. Now she is definitely showing all the signs and wants to be “a big girl”. I love ghee Huggies mimic wet knickers a bit as that helps her know when she has been to busy playing and we can dash off to complete the rest of her wee! Great article. I totally agree with all these myths in particular myth 5. That was our main struggle and patience is key. My son loved his big boy pull-ups which really helped him transition to real underwear. Ellena, it’s so sweet when they really relish the next step in growing up into big boys and big girls. Kind of a bittersweet moment no matter how much we look forward to it! Potty training was a good few years ago for us, but this is all good advice. The main thing I found helpful was to not worry about what others were doing, and just wait until my kids were ready for each stage. That’s such a great point. It’s easy to feel worried that your child isn’t where he or she should be compared with others, but it’s an individual journey. Great piece. Pull-ups were helpful for my son, who wanted to be fiercely independent early on. We also made potty-training more fun but having games like putting bits of cereal into the toilet bowl and doing a “target practice.” Vulgar, but it worked! Ha, I’d heard that this is a thing with boys. Less of an option with girls, I think, but it seems like the “hang out on the potty with a good book” is a tactic that works :-). Having potty trained 4 children I can confirm that there is no perfect formula – what works for one may not work for another. There is some excellent advice here and some brilliant top tips to help anyone who is trying this task. For me, it’s all about working with the child. When we were potty training the twins (and failing) I started to make a big thing of me going to the toilet and calling them in to watch. It worked, after a few times of watching they soon got the hang of it and started to copy. Targets have helped (for boys)–you don’t need to buy fancy ones, you can use cheerios. There are also some great potty books for kids you can keep in a little book shelf near the potty for some inspirational reading. And putting the potty on the back porch for my nephew worked wonders (Tx, so the weather is nice most of the year). He got his special time on his potty outdoors away. best advice, like all parenting, is to relax and follow thrir lead. Good tips! Really interesting post. For me, I found the whole potty training period (different for all 3 of my children interestingly too) very stressful. I was depressed at the time so saw lack of apparent progress as my fault and proof positive I was a terrible mother. The more we talk about this stuff and support each other the better. Guide looks really clear and helpful. Of my two children, my daughter (my eldest) got potty training fairly easily. When my son was of the age where his peers were potty training, we tried and I thought it’d be just like his sister, but he wasn’t ready. I learned that kids need to go at their own pace and even though it is hard – don’t compare them to the progress their peers are making because that isn’t helpful to anyone. Pull-ups were handy during the day but it was night-time where we really struggled. It took years to get him dry – actually years! It was very stressful and isolating, as a parent you don’t want to complain about your child, because you know they can’t help it and that they will get there in the end, plus you don’t want to be judged by the other parents whose kids have ‘cracked it’. But you really need that support – this is where it is isolating. No-one knows what you are going through – wash loads upon wash loads of wet sheets, up all night with a child who “should” be dry by now. We tried loads of different strategies but in the end what worked for us was an enuresis alarm – when we got that – he was dry at night within a week. I just wish I hadn’t struggled alone for so long. My son and I were in it together and he knew I had his back and was there to support him, but I was alone. It was awful and I’m glad my days of potty training children are over for good.